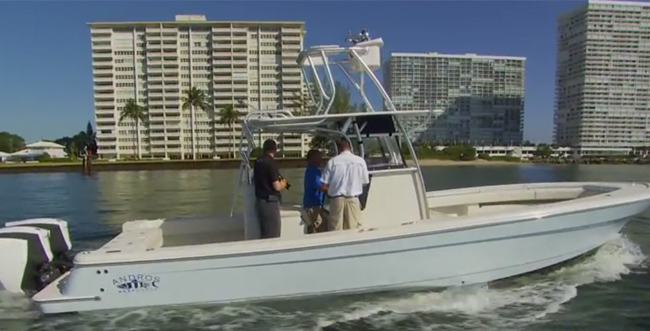 This fishing boat is fast enough and tough enough to grab even the DEA’s attention. Want a boat so hot it vaporizes the water—even when it’s tied to the dock? 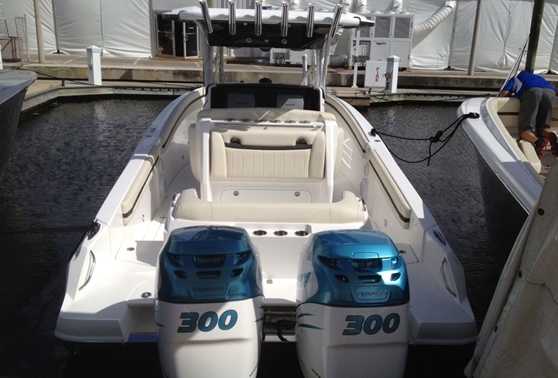 The Midnight Express 37 Open Fish is just such a beast, toting quad 300-hp outboards on a thoroughbred hull that’s crafted with cutting-edge components. 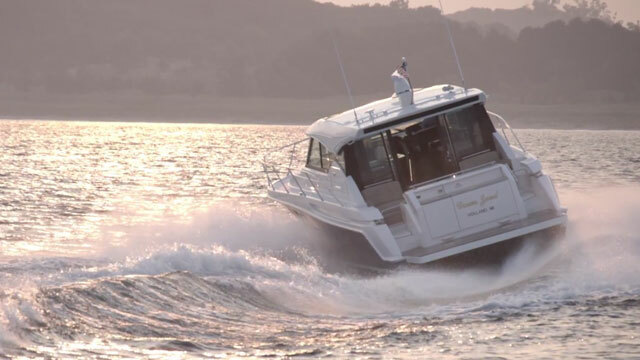 With quad 300-hp engines and heavy-duty modern construction, the Midnight Express 37 Open Fish is a blistering-fast sea beast. 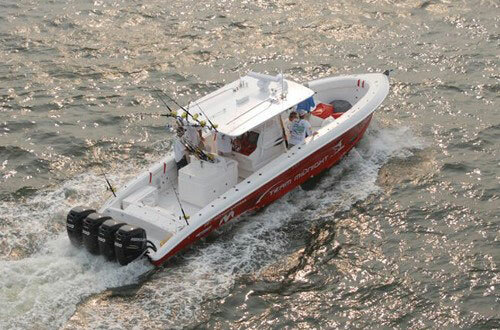 This fire-breathing fishboat is lightning-fast, with a 75-mph top end. 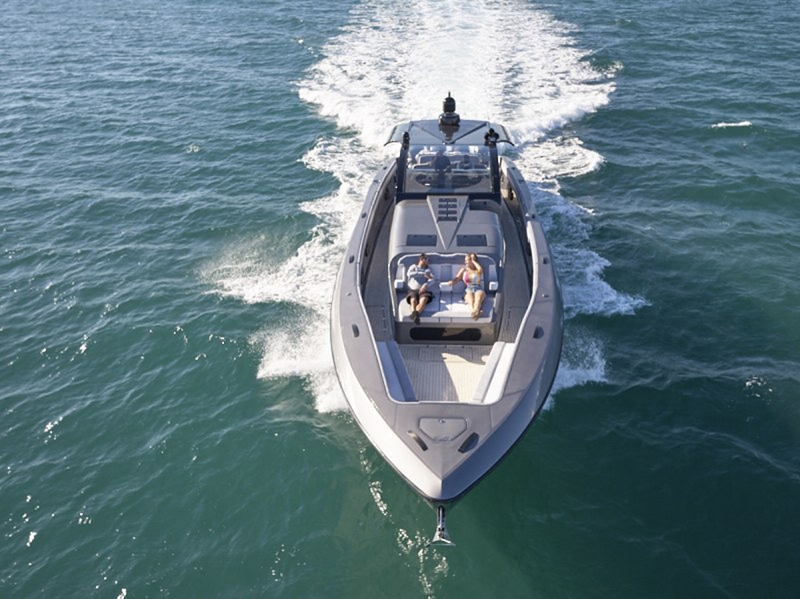 The hull design is the same one Midnight Express uses when it’s building boats for drug-interdiction and military uses—a common task for this company: they’ve sent their 39 Interceptor to countries across the hemisphere. These boats incorporate an exceptionally low center of gravity, a wide beam (for this type of boat), and a pair of bottom-aerating steps. 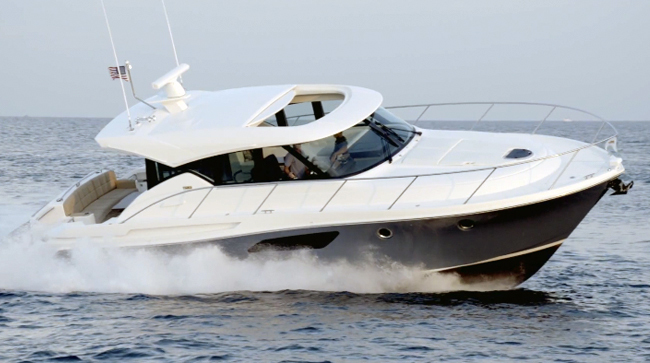 A 22-degree deep-V keeps things smooth even at high speeds, and a spray rail on the bow keeps things dry, too. An optional freshwater misting system in the T-top and under the gunwales will keep anglers cool in the hot sun. 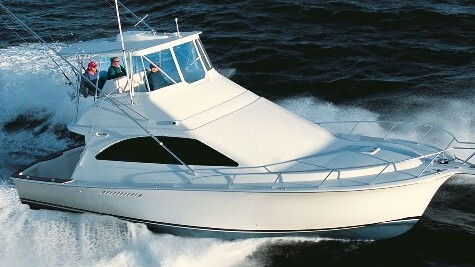 You can’t send 15,000 pounds of fiberglass rocketing across the waves at these kinds of speeds unless the boat is constructed like a brick you-know-what, and Midnight Express maximizes the 37 Open Fish’s toughness factor by building it with the latest and greatest construction methods and materials. Resins are vinylester and isopthalic, aluminum is powder-coated, coring is Nida-Core polypropylene honey-comb, and fiberglass is vacuum-bagged. 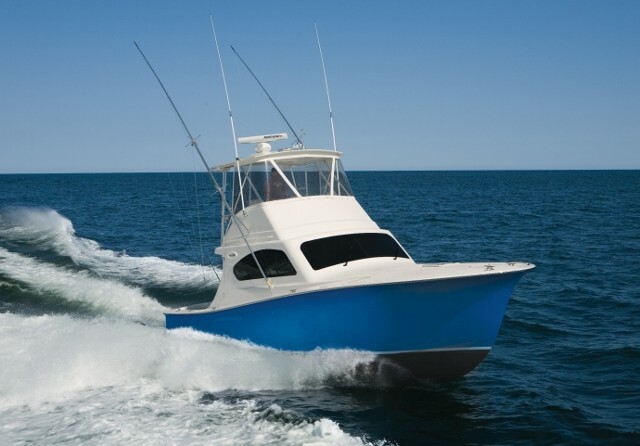 Accessories are also top-shelf; consider the Kiekhaefer racing trim tabs, hydraulic stainless-steel dual-stage rams, magnetic bilge-pump switches (which carry a lifetime guarantee, by the way), and a Frigid Rigid stowage box. Filling that Frigid Rigid with the catch of the day, as well as filling the four integrated and insulated fishboxes, shouldn’t be a problem, either. The 37 Open Fish may look like it was born for speed, but it has a serious dose of fishing fanaticism in its genes as well. 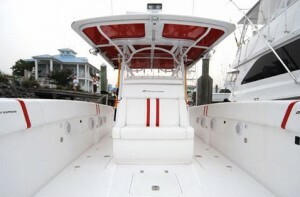 The boat comes with custom outriggers, pre-wired electric reel plugs, a 20-drawer integrated tackle stowage system, and a customizable livewell system with up to three separate live wells. Rod holder layout is also customizable, with over a dozen flush mounts per side available, plus T-top rocket launchers, if that’s what you desire. 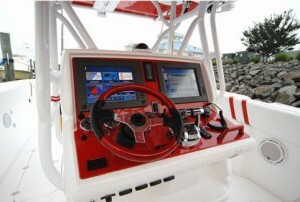 There’s room on the steering console for a double screens to display navigation and systems info. Fishing-wise there aren’t any real trade-offs. When it comes to fuel economy, however, be prepared to pay a price. A big price. At cruising speeds you can expect to burn a gallon of gas for every mile you travel, and at WOT, fuel burn with quad 300s is a painful 116 gallons per hour. That means you’ll be getting a mere 0.6 mile per gallon. One other potential trade-off: Midnight Express uses an oval-shaped pattern in its nonskid. This has the advantage of being easier on your skin than standard diamond non-skid patterns, which can be downright painful to kneel on. It’s a bit less aggressive, however, and may seem more slippery when wet or when covered in fish slime. On boats of this nature, alas, personal comfort is sometimes disregarded n favor of performance and fishability. Not so, in this case. The Midnight Express’s console cabin is surprisingly large with a whopping 6’6” of headroom and contains a fixed head. Boarding steps swing down from under the gunwales, which are lined with PVC-backed coaming bolsters. But the best comfort feature is, without question, the built-in misting system. Opt for it, and a cooling freshwater mist will emanate from above (via the T-top) and below (via the gunwales), to keep you cool in the blazing summer sunshine. No matter how sweltering it gets, you won’t feel like you’re getting boiled—even as the water beneath your red-hot hull is being vaporized. 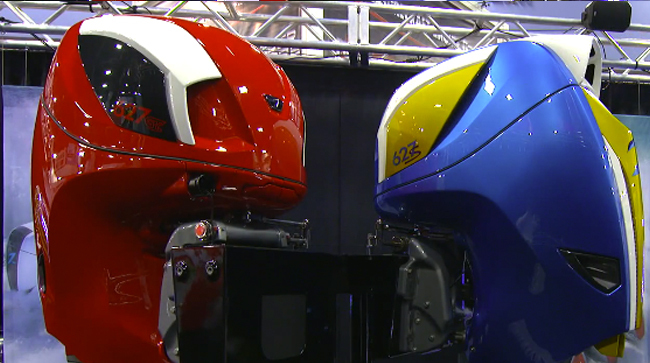 Comparison shoppers will want to see the Fountain 38CC Open, Intrepid 370 Open, and Deep Impact 36 Open. For more information, visit Midnight Boats.